Tippling Club launches a new Sensorium menu in collaboration with fragrance specialist International Flavors & Fragrances (IFF) that pushes the boundaries of a sensory cocktail drinking experience. The next time you drop by the bar at Tippling Club for a drink and ask for a menu, don’t be surprised by when it arrives. 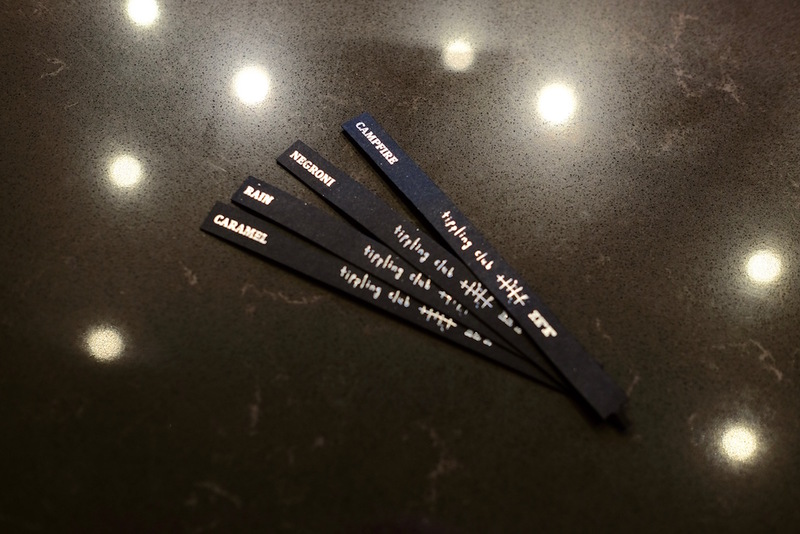 Tippling Club’s new Sensorium cocktail menu comes in the form of fragrance strips – developed in collaboration with New York-based fragrance makers International Flavors & Fragrances that recreates the scent of the various cocktail drinks on offer. The idea, of course, is simple. It is estimated that about 60-80% of flavours we taste come from our sense of smell. By allowing patrons to actually smell the curated scents it helps them understand the cocktails better and thus narrow down choices that would be not be possible by merely looking at descriptions on a printed menu. More importantly the smells also help trigger various memories that may rouse patrons with various deeply-rooted emotions. The strips do hold written information of the ingredients for each cocktail as well, for those who prefer the usual method of picking drinks. 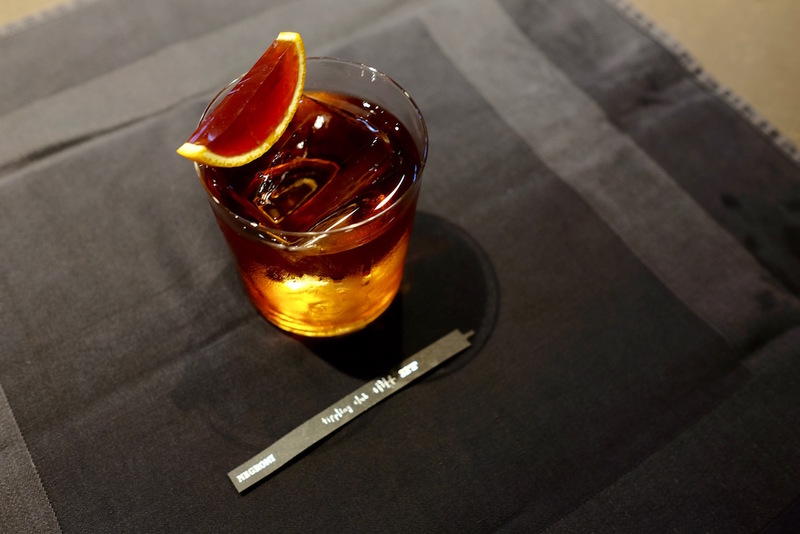 Sure, the Negroni (above) smells exactly what you’d expect the classic cocktail to smell like – with notes of Campari, vermouth and gin. But the Rain is really reminiscent is the scents of a wet, drizzle hitting the sidewalk pavement on a cool autumn’s evening, although it thankfully tastes more like a vodka-laced Greyhound with its citrusy notes. Then there’s the enigmatic Campfire, a smoky, ashy concoction that reminds one of sitting around a dwindling hearth. Even the accompanying garnish brings to mind a toasted marshmallow left on the fire for that wee bit too long. Caramel, on the other hand, brings a recollection of sticky toffee caramel sweets, of those stolen moments when you snuck your hand into the candy jar without your mom looking. But our favourite? Leather, that intoxicating mix of whisky, leather, pedro ximenez, orange and vanilla, that is likely to elicit memories of the lingering scent of a doting father that had gone too soon. The amazing part of the Sensorium menu of 12 different cocktails is actually not so much the fragrances themselves, but the sheer artistry that has gone to concocting those cocktails. It is obvious that Tippling Club chef-owner Ryan Clift and recently appointed new head bartender Joe Schofield know exactly what they’re doing with the flavours to complement those scents, resulting in delicately well-balanced, flavourful drinks that are both comforting and exciting at the same time. All cocktails on Tippling Club’s new Sensorium menu are $22++ each. They are now available at Tippling Club from Monday to Saturday throughout lunch, dinner and bar service hours. Tippling Club is located at 38 Tanjong Pagar Road, Singapore 088461.